FOREX TRADING GUIDE: HOW DOES OIL PRICE AFFECT THE CANADIAN DOLLAR ? HOW DOES OIL PRICE AFFECT THE CANADIAN DOLLAR ? Canadian Dollar, also named with the nick name "Loonie", is one of the members of the group of commodity currencies. Traders who are trading the currency pairs that have Canadian Dollar as base currency or counter currency need to understand the correlation between the oil price and the Canadian Dollar. For the Canadian Dollar oil price is as important as the monetary policy. Why does oil price effect Canadian Dollar? The simple answer of this question is that Canada is one of the top ten oil producers in the world. According to the statistics, in 2015 Canada is in sixth position in the list of oil producing countries. Canada produces 3592 thousand barrels oil per day, which is 3.90% of the total oil production of the world. Most importantly Canada exports major part of its produced oil to United States, which is the largest oil consumer in the world. United States alone consumes 18,840 thousand barrels oil per day, and a big part of it comes from Canada. 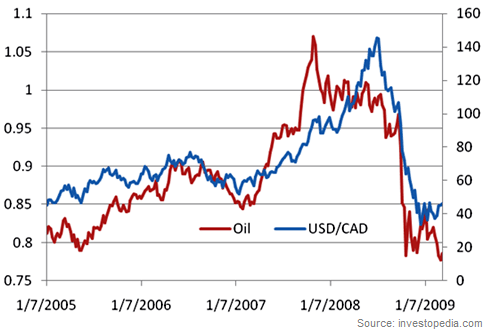 This is the main reason behind the correlation between oil and Canadian Dollar. How does oil price effect USD/CAD? USD/CAD is one of the most affected currency pairs by oil price. This is because United State is the largest oil consumer of the world and Canada export a large part of produced oil to United States. Since Canadian Dollar is the counter currency in the pair hence USD/CAD is negatively correlated with oil price. So if the oil price goes up, USD/CAD currency pair goes down. On the other side, if oil price goes down, USD/CAD currency pair goes up. Let me draw an example. Let the oil price goes up from $50 a barrel to $60 a barrel, so the United State will need more Canadian Dollar to buy the same amount of oil. As a result the demand for Canadian Dollar will increase and hence the price of Canadian Dollar. Alternatively, if the oil price goes down from $60 a barrel to $50 a barrel, United States will need less Canadian Dollar to buy same amount of oil. This will result a decrease in the demand of Canadian Dollar hence the value of Canadian Dollar. How does oil price effect CAD/JPY? CAD/JPY is another currency pair that is directly affected by the oil price. We already know that Canada is one of the top ten oil exporter in the world and Japan is one of the top ten oil importer in the world. According to the statistics, in 2013 Japan imports 3,408 thousand barrels oil per day. 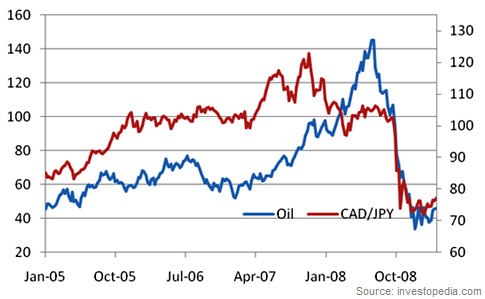 As Canada is an exporter of oil and Japan is an importer of oil, CAD/JPY is positively correlated with oil. Let me draw an example. If the oil price goes up from $50 to $60, Japan will need more Canadian Dollar to buy the same amount of oil. In other way, if the oil price goes down from $60 to $50, Japan will need less Canadian Dollar to buy the same amount of oil. So with the increase of oil price the demand for Canadian Dollar increases, and with the decrease of oil price the demand for Canadian Dollar decreases. These are the basics regarding correlation between Canadian Dollar and oil price. Not only Canadian Dollar but the entire currency market is affected by the oil price. In my next post, I will write some other posts on the effect of oil price on currency market. If you have any question, you can drop a comment below. I will be there to answer your question as early as possible.